to locate and probe underground structures. understanding and optimizing the process by which the waves are produced. receiver being common to both legs of the cross. the link which makes this possible. generation but will also allow the optimization of the process by which the waves are produced. enhancement technology for communications and surveillance purposes. probes to determine the characteristics of the Earth, the ionosphere, and the magnetosphere. York, 1988], it is important to explore alternate means of generating these waves. of 70-110 km, depending upon the HF frequency. This technique works in the following way. very difficult to interpret because of the well known variability of the auroral ionosphere. cross consists of five receivers, each spaced by a distance of ~70 km. Fig. 1. Schematic representation of the nine element ENIACarray proposed for theHAARP facility. The basic configuration is that of a cross with perpendicular arms. At each site the 4 channel VLF/ELF receiving system measures the signals on 3 orthogonal loop antennas and one vertical electric antenna. For clarity in the figure, only two loop antennas are shown at each site. The spacing between each site is ~70 km. The source region where the HF modulated auroral electrojet currents are located is in the 70-120 km altitude range. quantities J and . are related through the equation of continuity. significant gradients in the local conductivity, such as near the boundaries of the heated volume. modulated currents, and dV is a volume element in the source region. of the image currents. However, the solution proceeds in a similar manner. to use the HF beam pointing capability to move the heated region with respect to the fixed sites. few degrees more from the vertical and repeating the azimuth sean. by the HF beam at 80 km altitude when the HF frequency is 2.8 MHz and the beam is vertical. of B for a grand total of 500 measurements of B, as required. Fig. 2. Effective area sampled by the proposed ELF/VLF interferometer array. The center solid circle includes all points with respect to the center of the heated region that can be sampled by the central site of the array as the HF beam moves from 0 to 30 degrees from the vertical and at each zenith angle moves through 360 degrees of azimuth. The other circular regions represent the effective area sampled at the other 8 sites as the beam swings through the same angular range. The dashed circle at the center of the central solid circle is the projection of the source region onto the ground when the HF beam is vertical and the frequency is 2.8 MHz. of the beam at ~ 80 km. Since by definition .J2 = 0, we can express J2 as the gradient of a scalar F, i.e., : J2 = .Φ. for any driving frequency in the ELF range. programmable processor during these regular site visits. the amount of data that must be subsequently stored. Fig. 3. System diagram of one of the nine identical ELF/VLF receivers constituting the proposed inteferometer array. At each site, the ELF/VLF signals from the 3 orthogonal loop antennas and the vertical whip antenna are fed into a Stanford-built 4 channel preamplifier box. The 4 outputs from the preamplifier are sent to a Stanford-built 4 channel line receiver where the signals are broadband filtered to remove high frequency noise and clipped to prevent saturation from impulsive signals (due to lightning discharges). The 4 signals are then fed into a programmable i386-Engine-M processor, which extracts the average variation of each field component over the course of a single cycle of the HAARP heater. The HAARP transmission and modulation schedules are known a priori and the processor is programmed to process the data only during these times and at the specified frequencies, thus minimizing on-time for the processor (to save power) and data volume. The processed data is stored in flash memory cards. The stored data is downloaded (by connecting a portable NoteBook computer) from the memory cards during regular visits to the site. Any changes in recording schedules and frequencies are also downloaded to the programmable processor during these regular site visits. by road (with car or snowmobile). semi-permanent, and can be done in advance to save time. shown in Figure 3, except for batteries. 6) Visit each site once every five days (see subsection on Batteries) to replace batteries. Items (5) and (6) above will be continued until the end of the experimental campaign. CD-ROMs, both features being necessary to facilitate battery-powered operation. Fig. 4. Stanford ELF/VLF receivers at unmanned automatic geophysical observatory sites. This system, currently operational at five different remote high latitude Antarctic sites is currently deployed at the AGO sites P1, P2, P3,P4, and P5. It consists of a magnetic loop antenna (either a 1.7x1.7m or 4.9x4.9m square � both shown in the photo above) connected to a preamplifier (grey box with sealed lid shown in lower left) buried immediately underneath, which is powered by and sends data over a ~500 ft coaxial cable (shown rolled up) to the station (shown in upper left), in which resides the main receiver unit (the box with the blue front panel) consisting of a line receiver, various fixed band filter channels, and a broadband snapshot system, as depicted in the block diagram. This �low power� ELF/VLF system specially designed for unmanned sites with limited power nevertheless consumes ~6 to 7 W, depending on operational modes. 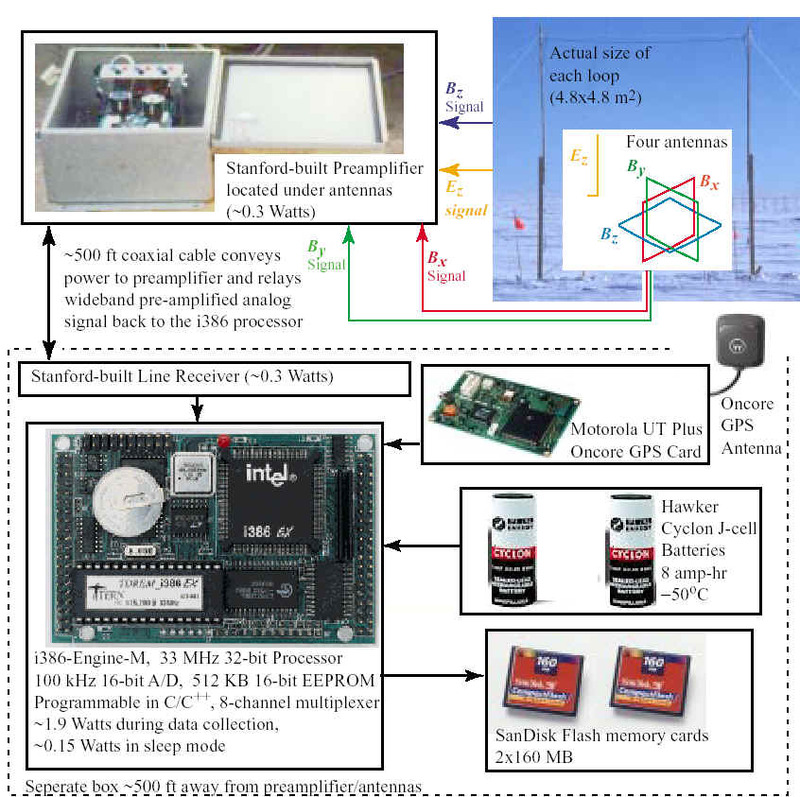 The broadband snapshot system in these units (the upper left corner of blue box) has recently been redesigned to utilize the programmable i386-Engine-M processor, which also forms the basis for the individual elements of the proposed ELF/VLF interferometer system (see Figure 3). have special terminations at both the send and receive ends. during which modulated heater transmissions will be carried out with the HAARP facility. Low power consumption: 1.9 Watts in normal operation, and 0.15 Watts in sleep mode. 512-KB 16-bit EEPROM, programmable in C/C++, with quick debugging/testing. 512-KB 16-bit SRAM, with memory expansion board available. 100 kHz 16-bit A/D, with 8-channel multiplexer. 10,000 sec, which is about ~1 usec/day. The drift due to aging is larger, about ~10 usec/day. consume a negligible average power of only ~5 mW. single waveform for ~5.3 hours. sites, to download flash memories and replace batteries (if needed; see below). be carried out after the data is extracted from Flash Memory. bandwidth. This approach would relax data storage requirements by a factor of ~10. processor design, Ph.D. Thesis, Stanford University, Stanford, California, 1999a. Geophys. Res. Lett., 18, 1971, 1991. J. Atmos. Terr. Phys., 44, 1113, 1982. Cepadues Ed., Toulouse, France, 1985.
on the ground, J. Geophys. Res., 89, 1655, 1984. 9. Kapustin, I., R. Portsovskii, A. Vasilev, V. Smirnov, O. Ruspopov, L. Solovera, A.
VLF modulation,Geophys. Res. Lett., 18, 309, 1991. 11. Kimura, I., P. Stubbe, M. Rietveld, R. Barr, K. Ishida, Y. Kasahara, S. Yagituni, and I.
and European incoherent scatter radar, Radio Sci., 29, 23, 1994. Arcad 3 Project and of Recent Programs in Magnetospheric and Ionospheric Physics, p.
608, Cepadues Ed., Toulouse, France, 1985.
modulated HF heating of the polar electrojet, Radio Sci., 25, 1291, 1990. 15. Shanaa, O., et al., A fully-integrated 2 GHz SiGe bipolar RF frontend, 1999.
and ELF wave generation, Geophys. Res. Lett., 19, 61, 1992.